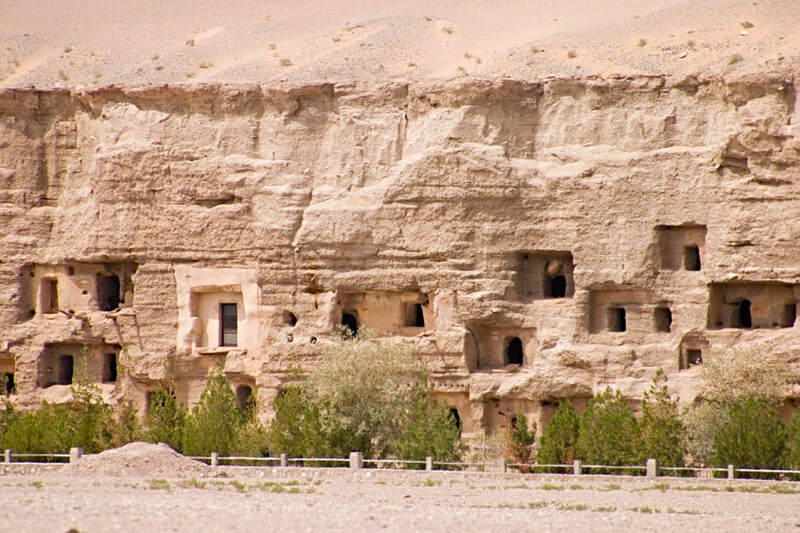 Located 25 kilometers of the southeast of Dunhuang, Mogao Caves originally built between 350 and 394. It includes 735 caves with 45,000-square-meters frescoes. The caves are situated on the cliffs of the Echoing-Sand Mountains, stretching for 1,680 meters long from south to north. Mogao Caves is divided into two areas, the south and the north. The southern area is the place where people worship for the Buddha. There are 492 caves from the Former Qin Dynasty (350 - 39) through the Tang Dynasty (618 -907) to the Q ing Dynasty (1644 - 1912) and more than 2,400 painted sculptures in the southern area. The 243 caves in the northern area are the places where monks practiced, lived, and where they were buried after their deaths. In these caves, you will find living facilities such as heatable adobe sleeping platforms, hearths, chimney flues, niches, lampstands, and etc while there is no frescoes in the caves. At Mogao Caves, you can appreciate painted sculptures, such as Buddha, Bodhisattva, Buddhism disciples, Heavenly Kings, and Hercules. There are circular engravure and reliefs. Most of the sculptures are made in clay. The Buddha statue is centered with the disciples, Bodhisattvas, Heavenly Kings, and Hercules on both sides. The frescoes are painted on the walls, ceilings and in the niches for Buddha. They present the information of seven themes including Buddha statues, Buddhist stories, Buddhist historical sites, changes, gods and spirits, donors, and decorative patterns. Some frescos also demonstrate the then various aspects of social life such as hunting, farming, textiles, transportation, wars, construction, dancing, weddings and funerals. They reflect the artistic style and characteristics of different periods. There are only a few buses passing by Mogao Caves. Therefore, there are only a few options. Rent a vehicle to the caves. This is the quickest and most direct option. Take Bus 3 to the Stop of Echoing-Sand Mountain (鸣沙山). The caves administration just allows 6,000 persons to visit the caves in one day. Therefore, you are required to book the ticket online 1 day prior to your visit date at least. The luggage, big handbags, cameras, selfie sticks, cameras are not allowed to be brought in. They could be storage at the entrance for free. It is not allowed to take photos in the caves. It is suggested that you check out some information on Mogao Caves beforehand, which will make your exploration more wonderful. If the weather is very bad, such as rainy or sand storm, the caves are closed. Please check out the weather ahead of time. Before exploring the caves, you are required to visit the Mogao Caves Digital Display Center to watch two documentaries on the caves. Then, you can visit the caves from the center. Interested in visiting the Mogao Caves on a Tour? Wendy Wei Tours offers a variety of different packaged tours as well as custom tours including the Mogao Caves, among other attractions and destinations. To find out more, please visit our Tours page or Contact Us directly to find out more.